So, my job requires me to taste and experience food from all around the world but I would personally describe myself as a “comfort cow” – somebody who finds solace in familiar food and things. 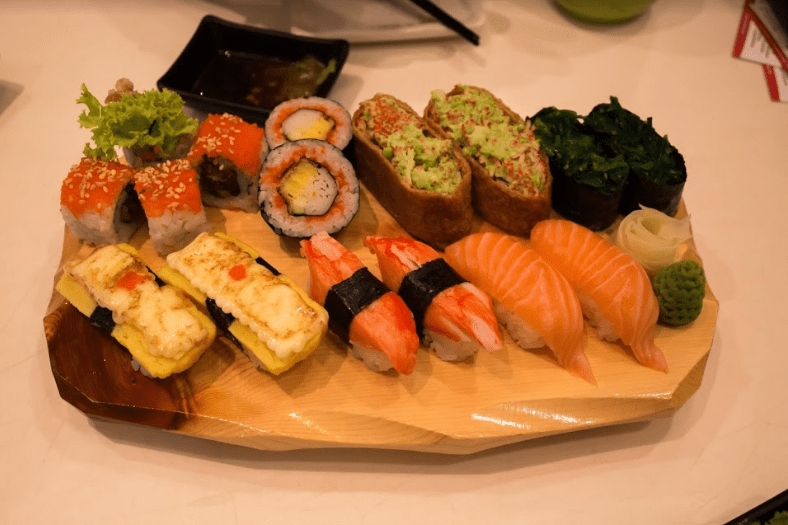 Growing up eating Indian and Malaysian food, Japanese food, especially sushi and sashimi, is somewhat a shock to my senses and I have never been tempted to give it a try. 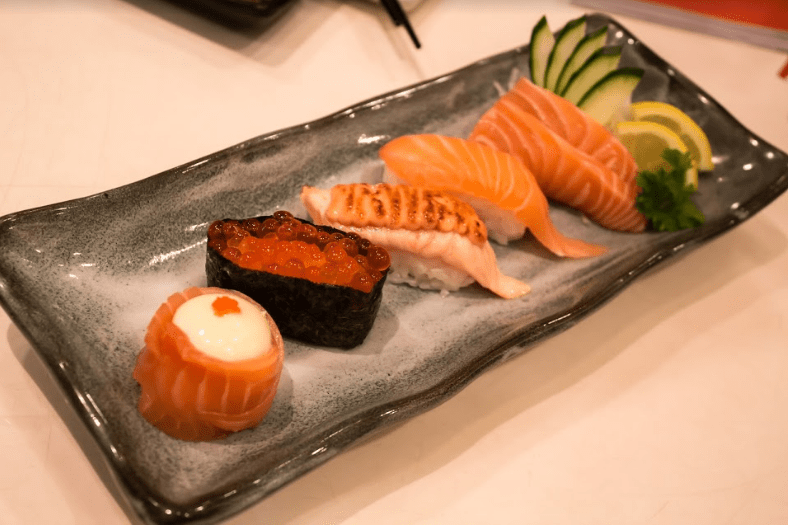 When I was given the chance to review Sakae Sushi, the well-known Japanese restaurant chain, I was pretty reluctant – simply because I am not well-versed in the sushi and sashimi department and would not be able to give an educated review. However, my colleagues and the good people at Sakae Sushi encouraged me to try everything and to treat the review as a learning experience, and so here I am to talk to you about it! The first thing you would notice when you walk into any Sakae Sushi outlet is their iconic green frog mascot. Forgive my gushing, but it’s soooooooooooooooo cute – a true cuteness competitor to our own Panda! Once we were seated and comfortable, a bevy of colourful Japanese delights were brought out for us (especially me) to try. Was I nervous? Absolutely, but I was excited too! First up was the Sashimi Mori Zen, which featured 5 different kinds of freshly sliced sashimi, from air-flown Atlantic salmon to octopus. The trepidation was real – I was about to put raw fish into my mouth! The first one I popped in was the butterfish, which tasted creamy, mild and actually quite good to my unaccustomed tongue! The one fish I found had a strong flavour was the tuna – the others were pretty noob-friendly. 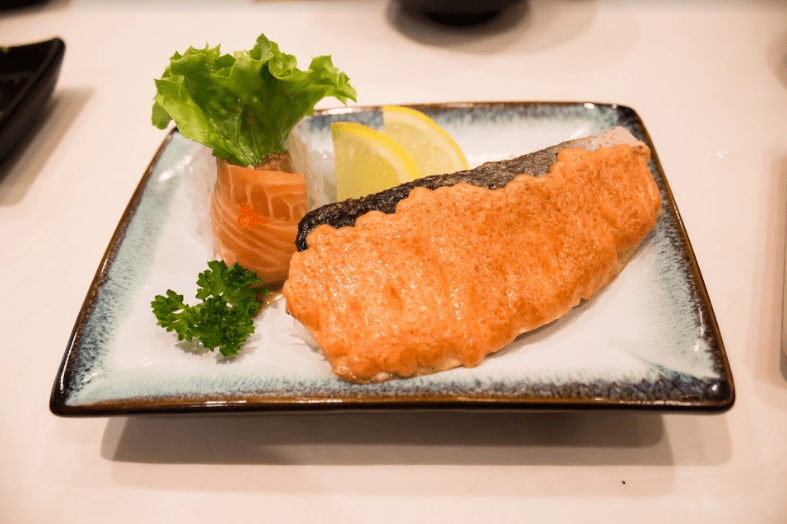 The next dish that came along was the Salmon Treasures specialty, which basically was salmon served five ways – sashimi, sushi, mentai sushi, ikura gunkan and hana maki. I picked the hana maki to try, because it looked cute and I’m a big fan of mayonnaise in any form. To my pleasant surprise, it tasted fresh and tart (because of the mayonnaise). Instant fan! I never knew there were so many sushi types and different ways of preparing sushi. I felt pretty overwhelmed at the types presented in the Fuku Set, which looked super pretty and very Instagram-worthy, by the way. Out of the many, the one that looked super appetising to me was the cheesy tamago sushi – which was the one with the omelette slice on top. It was slightly salty, because of the salmon roe, but it balanced well with the cheese and egg and the special rice Sakae Sushi use for their sushis. My favourite of the day? 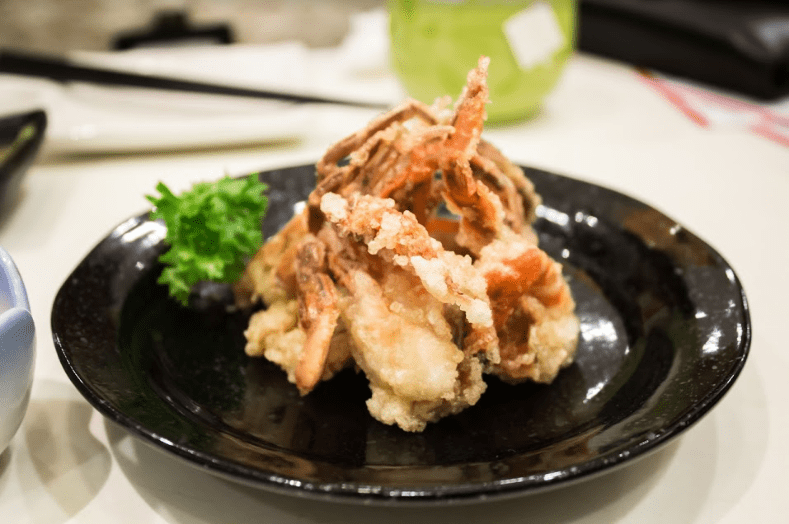 The Soft Shell Crab, which was just a simple flash-fried soft shell crab. But the flavours were out of this world, and it was crispy with a hint of creaminess of the crab flesh. Simply delicious! Another dish I really loved was the Salmon Mentaiyaki, because – surprise, surprise – there was mayonnaise! Jokes aside, the grilled salmon was perfectly done and flaky and the mentaiko mayo was a lovely accompaniment. All in all, I’d say my trip to Sakae Sushi was a success! I definitely learned a little about appreciating the freshness of sashimi and I discovered soft-shell crab, so never turning back! 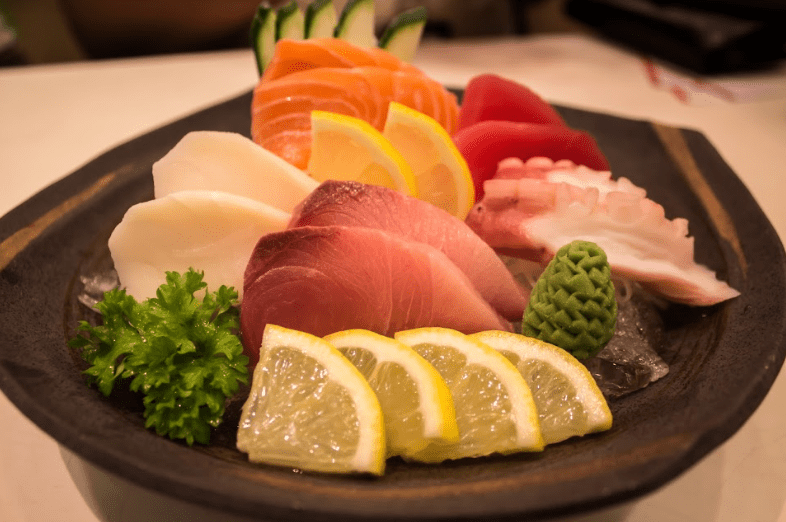 Click here to order online from Sakae Sushi.